First off, thank you all so much for your comments on yesterday's post. It always brightens my day to read the sweet things you say! I try to make it a point to respond to your comments because it means the world to me that you took the time to voice your opinion. I'm feeling a little under the weather today, and I just wanted to let you all know that I truly appreciate you, even if some of you may not have been responded back to just yet. Miraculously, I've made it about a year without getting sick, so I almost forgot the feeling (except that one time my dad had to drive over two hours to save me from food poisoning!). This isn't half as bad, being that I'm just hoarse and achy. I know also that I'm blessed to be able to work from home and take a day off when I really need it, so I can't complain. Awww, I hope you feel better soon! Being sick is no fun. Aww I hope you feel better! It won't be long. Especially if you're laying in those unbelievably comfortable looks sheets and drinking Vitamin C in organic juice form. Even still, get well soon, my friend!! Feel better soon! We're having really gray, stormy weather in WI, so it would be a perfect day to lounge. I hope you do the same! Hi Danie! Thanks for your comment, you are such a sweet and thoughtful person. I'm so sorry to hear that you are sick! :( that's the worst! hopefully some rest will do the trick! Your blog gets better every passing day!!! Have a nice weekend Danielle!! Ahhh. I just told my husband today that I can't remember the last time I was sick. Right after I said it, I felt like I'd probably jinxed it, you know? Now I read this! Get well soon sweet Danie! Janell: Thank you so much! It wasn't (and still isn't) graceful, but I'm feeling much better. :) If I don't jinx myself, I should be back at 100% in a day or two. I appreciate it so much. Kyla: Thanks, dear. I got a lot of reading done, at least. Gertrude: Aw, sweetie. I hope you're feeling better also! Thank you so much for your sweet words, as always! Lena: See, all I have to do is read your comments, and I already start to feel better. 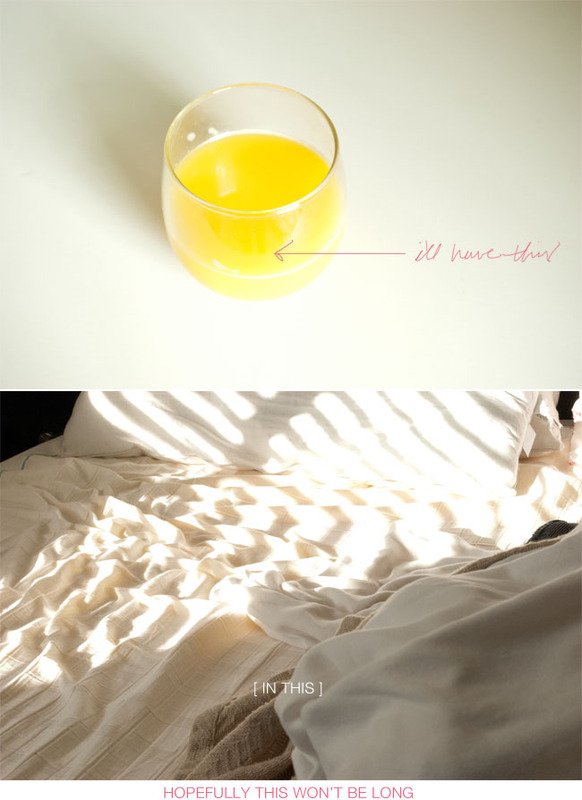 :) I'm lucky to have that orange juice and those sheets. Sarah: Thank you, sweetie! Ahh, I hope you found time to lounge around! I LOVE doing that during the storms. Beina: Thank you so much! You're always so sweet and optimistic. I love it so much. Hope you had a great weekend! Holly: I know!! That's what I'd been telling my husband so much also. Haha! Nooo, I'm sure you didn't jinx it. I don't think I've ever not been sick for this long (over a year), so I guess it's not too shabby. Anna: Thank you so much! I'm feeling so much better now. Just need a tiny bit more sleep. :) Gosh, I'm sure you need to catch up on SO much more sleep than I do since you're a mama. Now I really can't complain.